“The Stark Truth” – What is it like to die from COPD? The New York City Department of Health launched a new advertising campaign, in early March 2011, which graphically depicts the suffering of those dying from smoking-related lung disease. The city’s new ad campaign hopes to convey the message that dying from smoking-related lung disease is seldom quick and painless. 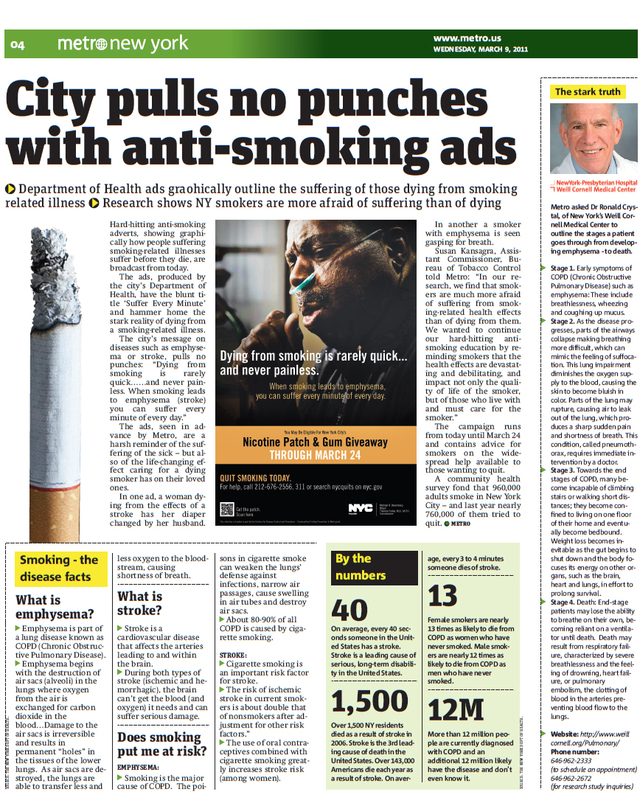 The Metro New York newspaper covered the launch of the new advertising campaign and asked Dr. Ronald Crystal (Chairman of the Department of Genetic Medicine and Principal Investigator) to outline the stages that one goes through, from the development of Chronic Obstructive Pulmonary Disease (COPD; including chronic bronchitis and emphysema), to death. The article, in the March 9, 2011 issue, is below in pdf form and can also be downloaded from the Metro NY’s website. 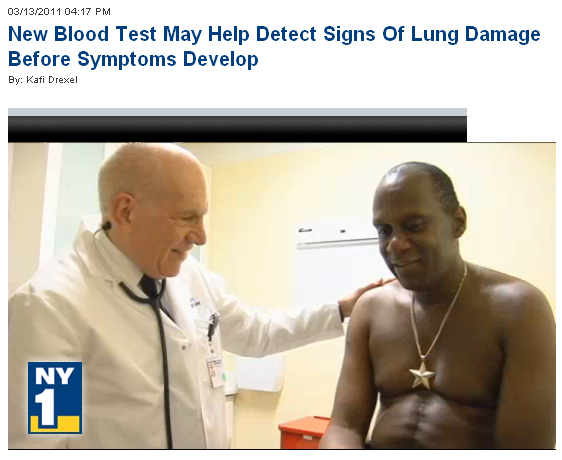 Dr. Ronald Crystal (Chairman of Genetic Medicine at Weill Cornell Medical College and Principal Investigator) was featured on NY1 television to talk about how a simple blood test may detect signs of emphysema, or lung damage, before symptoms develop in smokers. Smoking is the main cause of lung disease, such as Chronic Obstructive Pulmonary Disease (COPD) and emphysema. This simple blood test, is still under investigation; however, Dr. 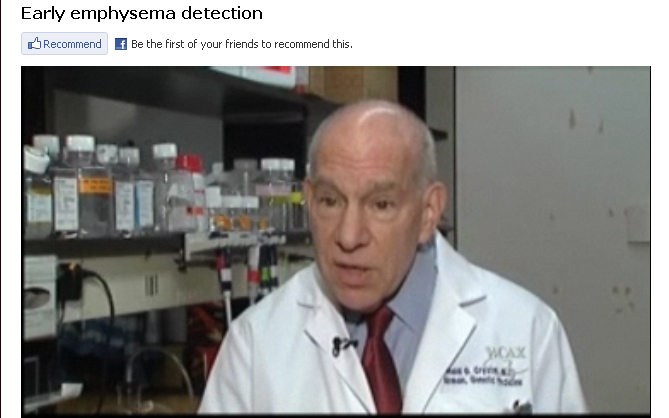 Crystal and researchers in the Department of Genetic Medicine hope that this blood test will help smokers detect signs of emphysema and inspire them to quit before it is too late. Are You at Risk for Lung Disease? Chronic Obstructive Pulmonary Disease (COPD) is a lung disease that causes breathing difficulties, which worsen over time. COPD is caused primarily from cigarette smoking. Signs and symptoms of COPD include: shortness of breath, chronic cough, wheezing, coughing up mucus and frequent chest infections. The Department of Genetic Medicine at Weill Cornell Medical College is seeking volunteers, 18 years and older, who may have COPD to participate in a research study looking at the effects of smoking on lung disease. Volunteers will receive $50 for completing a FREE 3-4hr lung health exam, including breathing tests, chest x-ray, physical exam, electrocardiogram (EKG), and blood and urine tests. Eligible volunteers can also receive $200 for a 3-4 hr bronchoscopy procedure. If you have a history of smoking and are having trouble breathing, call Malesa at 646-962-2672 to see if you are eligible for a free COPD screening. Are You a Smoker Diagnosed with COPD? Are You Trying to Quit Smoking? The Department of Genetic Medicine at Weill Cornell Medical College is seeking smokers, ages 18 or older who have been diagnosed with Chronic Obstructive Pulmonary Disease (COPD) to participate in a paid research study. Participants will be part of a study looking at the effects of smoking on lung disease. 3 lung health exams (including physical exam, electrocardiogram (EKG), blood and urine tests, chest x-ray and a breathing test) and bronchoscopy procedures lasting 3-4 hrs each and 5 visits to provide routing blood and urine tests lasting 30 minutes each.